The glaciers on Mount Kilimanjaro have shown a considerable decrease in area that has scientists hypothesizing about when — rather than if — the mountains’s white peak will completely disappear. With this glacial retreat, just how far-reaching will the consequences be? How much longer will these white peaks be visible? Figure 1. Mount Kilimanjaro. Photograph by Erik Cleves Kristensen, 2007, FlickrCommons. CC BY 2.0. Mount Kilimanjaro, a dormant volcano in Tanzania on the border of Kenya, has been a topic of interest for scientists for over 100 years.3 Kilimanjaro is located just 300 km (186 miles) south of the equator which has caused the snow cover on the mountain to be regarded as a peculiarity.3 Ernest Hemingway, the American novelist, once described the ice fields as being “as wide as all the world, great, high, and unbelievably white in the sun”.5 However, according to scientists, these incredible ice fields are nearing the end. Now, the question is not if the glaciers will disappear, but when. There are three remaining ice fields on the plateau and slopes of Kilimanjaro, all of which are shrinking.2 These ice fields are known as the Northern Ice Field (NIF), Southern Ice Field (SIF), and Furtwangler Glacier (FWG).2,4,10 From 2000 to 2007 all have experienced significant thinning.10 One measurement on the FWG showed that the surface lowered by almost 5 meters (16 feet) from 2000 to 2009. This ice field has already split due to such shrinkage. The effects on the SIF are not as extreme, but the ice has continued to diminish. The NIF is expected to shrink enough that it will split in half within the next few years.10 Numerous aerial photographs clearly outline the changes that the mountain has experienced since 1912 (Figure 2). Figure 2. 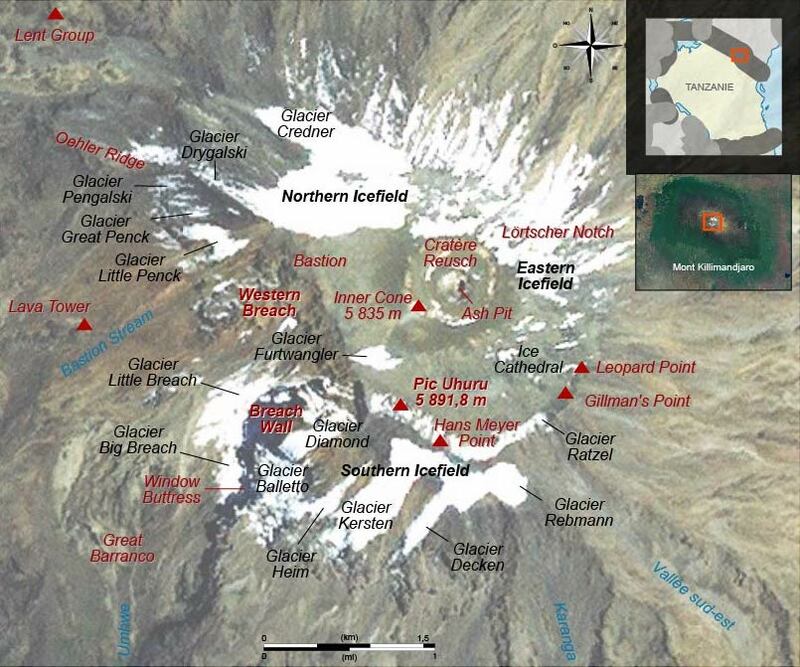 Kilimanjaro’s Disappearing Glaciers. Summit cover in 1) 1938, 2) 1993, and 3) 2000. Courtesy of Mary Meader, 1938, Wikimedia Commons. CC BY-SA 3.0., and NOAA, 2006, Wikimedia Commons. Public Domain. Figure 3. 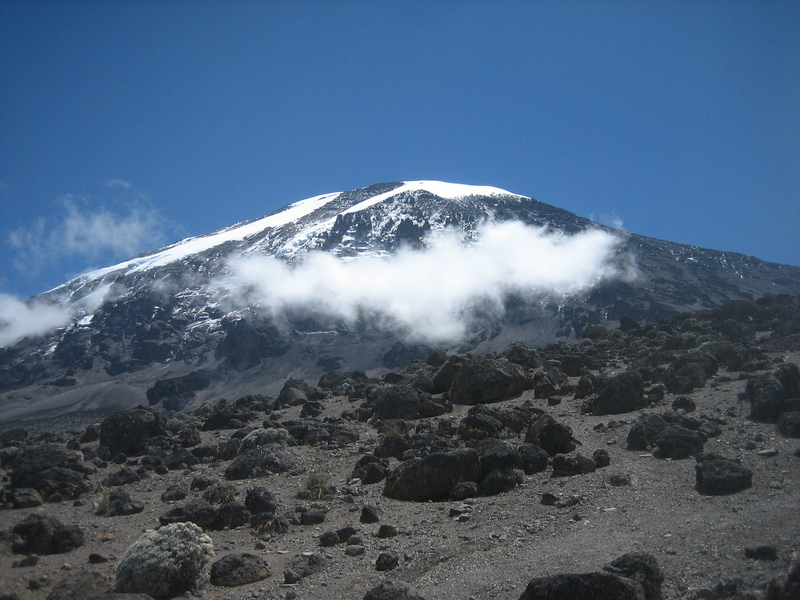 The summit of Mount Kilimanjaro with names of main glaciers, valleys, and peaks. Image by Semhur, 2008. Wikimedia Commons. CC BY-SA 3.0. Glaciers preserve extremely reliable records of history due to the ability of ice to freeze and keep intact many attributes of the surrounding environment. Such attributes include the air temperature, precipitation, atmospheric chemistry, and volcanic depositions.11 Additionally, the glaciers preserve human activities, granting anthropologists insight into the past. Thus, with the melting of glaciers, over 11,000 years of history is being erased.11 The glacial melting also raises concern for drinking water supply, sea level rise, crop irrigation, hydroelectric production, and tourism.11 A 2001 BBC article highlighted that Kilimanjaro is the primary foreign-currency earner for the Tanzanian government.1 The article stated that “twenty thousand tourists go there every year because one of the attractions is to see ice at three degrees south of the equator.”1 The melting of the glacier may cause the Tanzanian government to earn less money from a potential reduction in tourism to the region. The most recent reports of Mount Kilimanjaro’s glacial retreat have used linear extrapolation for all three zones (NIF, SIF, and FWG) to unfortunately conclude that the ice cover on the western side of the mountain could vanish before 2020 while the remaining ice will disappear closer to 2040.2,8 At the very latest, the ice will take until 2060 to completely disappear.2 These predictions only hold true if present-day conditions persist. Scientists are largely in agreement that ice cores must be drilled in a number of locations before the ice melts. More extreme options to prevent ice melt include the use of tarps to protect against solar radiation.7 Euan Nisbet, a Zimbabwean greenhouse gas specialist from the University of London, suggested draping the ice cliffs in white polypropylene fabric as a temporary fix.7 This would keep the ice beneath the fabric cool while research is conducted to find ways to develop reforestation plans. While none of these solutions will be a simple task, they demonstrate the efforts of people all over the world to preserve the historic ice fields of Mount Kilimanjaro. Figure 4. Ice core sample. Photography by Janine and Jim Eden, 2013, FlickCommons. CC BY 2.0. Earth Observatory News, National Oceanic and Atmospheric Administration. (2006). [Snow accumulations of Mount Kilimanjaro in 1993 and 2000]. Retrieved from Wikimedia Commons. Public Domain. Eden, Janine and Jim. (2013). 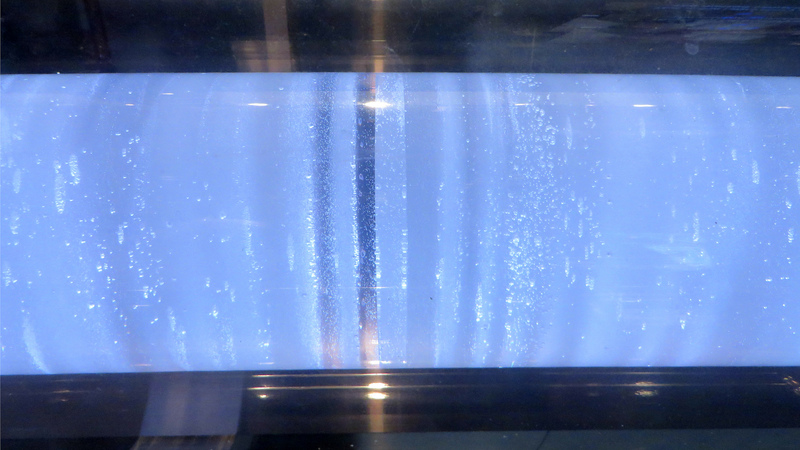 [Photograph of ice core]. Retrieved from FlickrCommons. CC BY 2.0. Kristensen, Erik Cleves. (2007). [Photograph of Mount Kilimanjaro]. Retrieved from FlickrCommons. CC BY 2.0. Meader, Mary. (1938). [Photograph of Mt. Kilimanjaro in 1938]. Retrieved from Wikimedia Commons. CC BY-SA 3.0. Semhur. (2008). [Map of Mount Kilimanjaro with main glaciers, valleys, and peaks]. Retrieved from Wikimedia Commons. CC BY-SA 3.0.